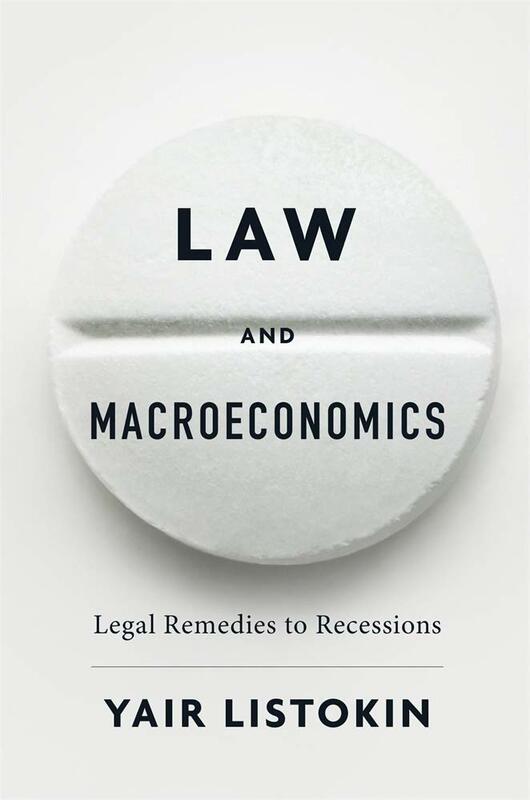 Wharton's Peter Conti-Brown talks with author Yair Listokin about his new book on legal remedies to recessions. Knowledge@Wharton: What is the correlation between the law and macroeconomics, and how there can be an impact? Yair Listokin: At the most basic level, law really affects spending. And I think people will be familiar with that just from their daily lives. Often if you want to spend, even if you have the money, often you may or may not be able to, and how you spend is affected by law. So the argument is that by changing those rules based on the business cycle we can raise spending when we think that is something that is important. And we can reduce spending if we think that is important. I actually focus on raising spending because I argue that that is the bigger social problem at least when interest rates are zero. Peter Conti-Brown: When legal scholars have been thinking about how economics can shape the institutional design of public policy they are mostly thinking about individual actions at the margins, so-called microeconomics. How do choices of individuals when we aggregate them affect the way the world works? And Yair, you are working on something very different, and the difference is pretty stark. How does your approach to law and macroeconomics differ from the generations that have preceded you in the academy in joining these two disciplines together? Listokin: I think the difference is actually similar to the difference between microeconomics and macroeconomics within economics. James Tobin famously said that it takes a lot of marginal improvements in the macroeconomy to make up for one episode of excess unemployment. And right now, historically, law and economics has been very focused on — entirely focused really on making those marginal improvements. And my argument is that there are times where those marginal improvements can be dwarfed by something as simple as increasing spending and reducing unemployment when unemployment is excessive. Conti-Brown: When we think about these kinds of questions about the macroeconomy, about excessive unemployment, about the levers the policy makers might be able to pull in shaping that institutional environment, the first thing that I certainly think of is central banks, right? Central bankers, the Federal Reserve. This is their corner of the sandbox. Why shouldn’t we just continue on that trend of just letting central bankers be the primary policy chiefs over the macroeconomy? Why do you see legislators and fiscal policy makers and others in a different context having an important seat at that table? Isn’t that why we created central banks, so that we could keep them away from that table because they are likely to mess them up rather than improve them? Listokin: Absolutely Peter. My argument about the role for law is very much focused on times where central bankers just don’t have the tools. So most obviously this would be when interest rates are confined by the zero lower bound. When unemployment is high the central bank would like to stimulate the economy. It usually does this conventionally by lowering interest rates, but interest rates are zero, and it just doesn’t have much room at all to lower them. Now central banks can call on unconventional monetary policy like quantitative easing, and things like that, to try to expand the economy. But the effectiveness of these policies is quite limited. And it also really pushes central banks into areas where we’re not used to having them. With quantitative easing of course, central banks were purchasing trillions of dollars in assets. That is not the role that we normally have in mind for the Fed, let’s say. The Fed is always incredibly important, but by purchasing trillion dollars in assets and things like that they have just kind of expanded their authority by a lot. And in addition to that, it is not clear that it is all that effective. So it is not enough, and the only way it could ever be enough would be if the Fed just really opened the spigots. Conti-Brown: I am hearing a really interesting discussion of a cost-benefit approach to what the tool might be, or what the right institution might be given these extreme contexts. Your book does a beautiful job of describing just how high the stakes are when we find ourselves in a financial panic with profound adverse impacts on the economy. Is there something about the just democracy that calls for more politics here engaging in some of the problems of these kinds of crises? And is that what your project is, is trying to have a more principled approach, a democratic governance to grab control of this? Or are you talking about something different? Listokin: There is an element of that. But only an element. I am concerned about the power of central bankers. I like central bankers, but I do think it is critical for there to be limits on their power. And I see that treating them as the only game in town for fighting recessions is pushing them very strongly towards ever more expansive roles. I don’t like that as a matter of democracy. I also don’t think it is all that effective. So the two things are in concert here. But I do think that it is better to have, from a democratic perspective, lots of checks and balances. Lots of people with a little bit of power rather than one or two sort of focal points of power which are hard to constrain. Conti-Brown: Let’s walk through a life cycle of what your ideas and your research and your proposals might represent. Say it is August 2007, and the housing markets in the United States are roiling. The U.S. Federal Reserve is watching this using regulatory levers primarily. And then using what we call in central banking, moral suasion, or kind of job owning the markets — and saying, things are pretty contained in the housing market, things are going to be OK. Fast forward a year, we’ve seen Bear Stearns collapse, now Leman has collapsed. Now there are really deep interventions from a regulatory and crisis intervention perspective. And now the central bank has dropped interest rates to zero. Where do you come in? What kind of place would the Listokin model of law and macroeconomics do, say, on November 1, 2008? Listokin: On November 1, 2008, interest rates are zero and unemployment is increasing at nearly unprecedented rates. I would argue that there are lots of options, and that is part of the argument of the book. But let’s take one in particular — utility regulation. Let’s say you are a utility regulator and a utility has come to you and wants to raise rates. And they have what in ordinary times would be a reasonable case for raising rates. I argue that if you allowed the increase that would be the functional equivalent of a tax increase on all of the utility’s customers – they would have less disposable income because they are paying more for utilities. At a time when there is not enough spending, when we are thinking of cutting taxes to increase spending or we would like to lower interest rates to increase spending but we can’t, a utility regulator should hold the rates down to put more money in the pocket of the utility consumer. This would put less money in the pocket of the utility investor. This can’t go on forever. The utility regulator would have to say that we know that we are holding rates down, and we are going to allow extraordinary rate increases once the economy comes back to health. So the idea here is transferring recession risk from utility consumers who are disproportionally poor, because the poor spend a greater proportion of their income on utilities — and transferring it from them, from the consumers who currently bear the recession risk, to the investors who by definition have access to capital. And utility rates would be fair and reasonable over the business cycle rather than year by year, which is what they currently are. Why isn’t what you just described much better handled through conventional fiscal stimulus? You said it was a functional equivalent of a tax cut, so why not just cut taxes? Why go sideways when you can take on this problem head on? Listokin: First of all, cutting taxes or raising government spending may not be enough because they are entangled with law. So here I am thinking of something like shovel-ready projects…. For example, in 2009, the Obama stimulus package included many tens of billion dollars for what were called shovel-ready projects. And the idea was that as soon as the law was passed this money would start being spent on doing things like repaving roads or something like that. Just projects that literally the idea was the shovel would go into the ground the next day after the money was appropriated and Congress approved. So that was the theory. Now Congress, in addition to appropriating the money and spending the money, they attached a lot of conditions to the money. So for example the money could only be spent on contractors who satisfied all sorts of conditions about the wages they paid and various procedures along those lines. Those conditions took a long time to enact, and turn into something tangible by the Department of Labor, for example. So the programs were delayed not because the money wasn’t there, they were delayed because the law was not responding to the crisis. Ordinarily it is OK if something gets delayed in order to do it right. That is a tradeoff we will often want to make, and that is why we have a lot of laws that delay things. But when we desperately want to spend money, that sort of restriction is much more costly. But Congress did not account for that. So on one hand they are spending money because they are appropriating money because they know they need to spend now. They want shovel-ready projects. But with the other hand, with the legal hand — so the fiscal hand is giving, and the legal hand is taking away. I want the hands working together. Knowledge@Wharton: How would the judiciary play a role in this process? Listokin: Judges have a lot of power, and they could be potentially part of the solution. And to give an example of that I would say, take something like the question of whether or not a judge should issue an injunction. Let’s say there is a dispute over whether a development satisfies a zoning law. Typically, the plaintiff in that dispute will come to the judge and say, “Before the question is decided, you need to prevent the building from being built. Prevent construction until we decide who is right and who is wrong, and only then can construction happen.” And the judge makes a decision over whether or not to allow or not allow. If the judge allows, it is not like the plaintiff has no remedies. The plaintiff instead — now the building may be built by the time the dispute is settled, but the plaintiff could get damages. The plaintiff could get some money to compensate them for the violation of zoning law. Right now the way these preliminary injunctions are decided ignores the business cycle. It is the judge who will or won’t stop the project based on factors that are business cycle invariant. My argument is that the judge should consider the business cycle. And if unemployment is really high, then the judge should be more likely to allow the project to go forward, and then solve any potential violations with money damages rather than stopping the project and waiting, perhaps delaying the project in the bust and perhaps finally allowing it in a subsequent boom. Conti-Brown: What is the one law that you would rewrite, or power that you would grant, institution that you would create … that would better equip the government to respond to crises? And let’s assume that any political process that would be required to get it there, you just have to create it. Listokin: I think the utility regulation example is — because utilities are a multi-trillion dollar business you would quickly have substantial stimulus or not based on — it would just be a new site of counter-cyclical policy that I think would be quantitatively very significant. And after that I would also say we want to make fiscal policy better than it already is. There is a lot that can be done with fiscal policy that we haven’t done. And I agree with you that fiscal policy is a good doctor to have involved, but a doctor that wasn’t so effective in the last crisis. Knowledge@Wharton: You propose a new government agency called the Office of Fiscal and Regulatory Affairs to manage all of this activity. How would it work? Listokin: One thing I have noticed is if something is not someone’s primary job, it has a tendency to slide. So my concern with this, with encouraging lots of different regulators to go ahead and consider macroeconomics is they have lots of other jobs and they wouldn’t necessarily remember in the next bad recession to start considering macro. The solution is to create some agency or office whose job it is to consider macro. And then they would follow what is going on in the macroeconomy, and then when things were bad they could then instruct all of the other agencies to go ahead and start doing the things that they had already thought about doing to enhance the macroeconomy. So it wouldn’t just be catch as catch can. There would be someone whose job it is to coordinate the policy, and who would be an expert in macroeconomics. Knowledge@Wharton: You write that this agency should have input whenever new legislation is being created. So how realistic is it that Congress would go along with this? Listokin: The idea would be that we could use someone who always thinks about macro. So one example that I like to give with respect to the Trump tax cut, that I heard many, many different policy perspectives on that act. I didn’t really hear too much about its macroeconomic consequences, at least as a counter-cyclical force. And they were significant. Having an office along those lines that would make it such that the Congressional Budget Office studies the effect on the deficit, but only in extreme times do they look at how something does over the course of the business cycle. I would like some parallel office that would focus on booms and busts. Conti-Brown: What do you see as a political path for improving fiscal policy, for having conversations about law? One of the things I like most about your book is that it is all over the map on our conventional political divides. There is a very left liberal story and a very libertarian right story. You are speaking to many audiences. Talk to us a little bit about the politics of implementing things like counter-cyclical utility regulation, things like either a congressional or executive office that would be more sensitive to macroeconomic implications for policy. Where are the political lanes that you would travel to see some of your policy goals accomplished? On the libertarian side, it would be deregulatory. There are certain cases in which deregulation can provide a stimulus. And I would say to people, “Well here is another argument for deregulation that you could use.” Now it would have to be deregulation in a time of high unemployment. It would be limited, but it would still be something you could potentially want. And then the flip side is I have also spoken at environmental schools. And I say, “Well you can impose environmental mandates and give another argument for them.” It is not just that we want to save the environment, we want to do it to reduce unemployment. So the hope would be that it doesn’t map so well on to the typical political divides. And that in that lack of clear political valance there is the potential for some common ground. Conti-Brown: Where does the research take you from here? I am smiling a little bit right now, because our listeners should know that in addition to being a dear friend, Yair and I are co-authors on a project that unites our common thinking about central banking and this idea that law has a role to play to structure the process and outcomes of central bank decision making. So putting that to the side, where do you go from here? What is the next project in terms of law and macroeconomics? Listokin: I think the role of law in central banking is something that you have been interested for a long time, Peter, but I think that there is a lot of work to be done over there. But then in addition there is — I think there are a lot of fields. For example, bankruptcy law right now uses a very simple model of credit provision that has no sort of boom bust asset cycles, and there is collateral but the collateral cycles, the leverage cycles that economists have really been pushing since the crisis, it doesn’t appear in bankruptcy law. Conti-Brown: And that is fascinating because that is a judicially intensive process, bankruptcy. And so having judges oversee a process that is just forged in a furnace of microeconomics, you are saying that judges actually have a policy role to play at the level of business cycle through that same apparatus? Listokin: Yes, very much so, and bankruptcy by its very nature is a collective decision process. We already know that we are affecting many parties. It is not a simple contract dispute which is sort of creditor/debtor. There is creditor and many, many debtors. So there is a lot of room for policy. And it is just this odd thing where the most exciting research on credit on the economic side, which is macro economically oriented, has not really been brought into our thinking about bankruptcy which is using economics that is just older and partially out of date.